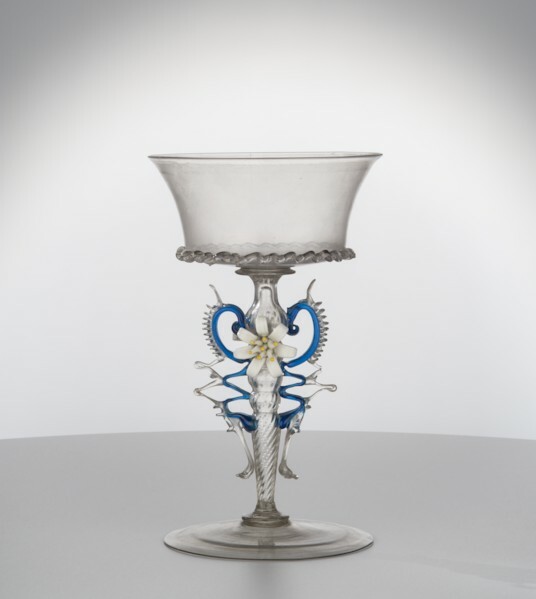 This goblet has a stem with many constrictions, pincered bits, a gold-leaf edge, and flameworked flowers. The flowers are premade by lampworking or flameworking. 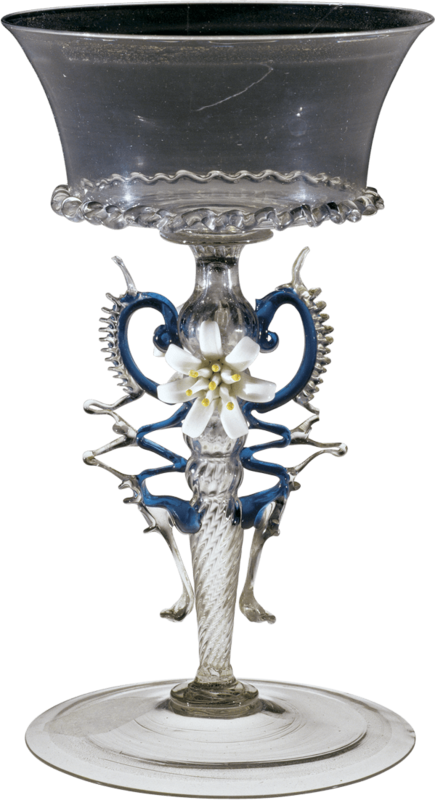 White glass is softened in a flame, flattened, and tooled to become the petal of a flower. A tiny amount of yellow glass is added to the tip of each filament. These will become the anthers. The petals are reheated and given their final shape. The flower is flame-cut from the gathering rod and placed on hold in an annealing oven. The goblet begins with a gather of glass that will become the cup. 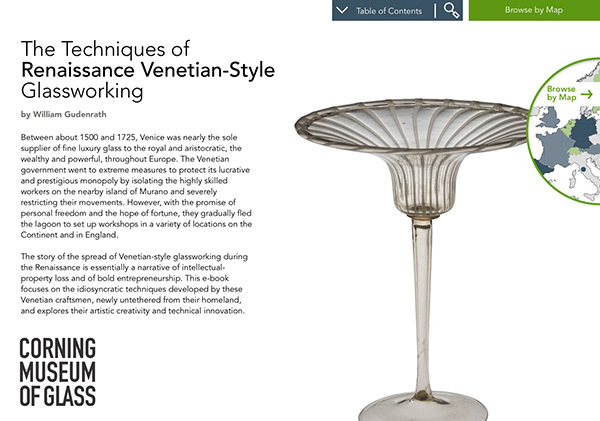 The glass is shaped with gravity and centrifugal force, and is rolled back and forth on the metal table called the marver. This makes the glass perfectly symmetrical with the blowpipe. Air is blown into the blowpipe, and a bubble forms. After reheating, the glass is further inflated and shaped to become an oblate spheroid. A constriction is formed between the vessel and the blowpipe. This will eventually allow the bubble to be broken free of the blowpipe. Excess glass is trimmed from the tip, and the sides given their final shape. The bottom is flattened and made slightly conical. A small amount of glass is gathered from the furnace and trailed onto the bottom of the vessel. This will become a merese or disk. It’s on the tip of this disk that the stem will sit. But first, a small amount of glass is trailed onto the bottom edge of the cup and tooled. A very small gather of glass is made on the end of another blowpipe, marvered. A bubble is blown, and this will become the stem. The stem is decorated with ribbing. The bubble is lowered into a dip mold, blown hard to create the ribs. The stem is carefully placed at the center of the disk or merese. A decorative constriction is made near the merese, and the stem is further decorated with a series of constrictions. Excess glass is trimmed from the tip of the stem, and another small gather of glass added to form another merese. It’s on this merese that the foot will sit. The foot is a bubble of glass lowered carefully onto center, trimmed free of its blowpipe. And a constriction is made, and this will create a hole that will become the rim of the foot. Throughout the process, the entire vessel must be kept well over 1000 degrees Fahrenheit. The jacks are used to create a little chimney at the tip of the foot. This is made perfectly cylindrical, and it’s rolled over gold leaf. The foot is reheated. The soffietta is used to cool the lowermost part of the stem and used to inflate the foot. And with reheating and tooling, the foot is given its final shape. The punty (or pontil) is attached to the foot, and the neck broken. With the goblet held by the foot, the rim can be reheated and tooled to create the final vessel shape. The jacks are used to create another chimney, and gold leaf attached to the rim of the cup. The glass is very thin and requires frequent reheats. The soffietta is used to inflate the vessel to its final size, and the jacks used to give the vessel its final profile. Next, the wing decorations are added. A small gather of aqua glass is flattened, attached, and cut free of its gathering rod and tooled to become the winglike shape. A small amount of clear glass is added, cast free of its gathering iron, and tooled to create this denticulate pattern. Being careful to keep the entire vessel above 1000 degrees Fahrenheit, the process is repeated. The flameworked flowers are attached by adding a small amount of glass and sticking the flowers on in place. After reheating, the glass is broken free of the blowpipe and annealed.